Hike to the Temple if the Scared Heart of Jesus and Parc d’Atraccions Tibidabo. If you fancy getting off the normal roads of Barcelona, walk to the top of town and keep going. As you walk up the mountain, you will come across tracks and roads, with benches to sit and enjoy the view. In the evening its a beautiful place to pause and watch the sunset, watching the city turn from day to night is wonderful! 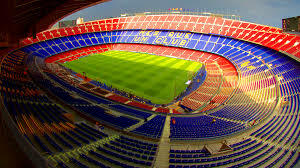 If you want to feel alive in the city of Barcelona, all you need to do is walk past the Camp Nou Stadium when a Barcelona FC game is on, the atmosphere is electrifying. It is a bit of a walk from the tourist area, but a couple of stops on a bus or the Metro and you’ll be there. Walk along Diagonal Avenue - This is a great way to watch the city change from the old town into the modern, expensive metropolitan style shops. Plus seeing all the statues in the middle of the roundabouts is amazing. You can always take a detour off of the avenue into surrounding coffee shops or gardens. It is a great street to know and get your bearings of, you can almost get anywhere from Diagonal Avenue as it’s an extraordinarily long road running through the heart of Barcelona. Go to Parc Güell, seeing the architecture so close is incredible. You can enjoy the surrounding park before entering, there is usually a street performer or two there making the place really come to life with music. All of the colours and shapes are vibrant and beautiful to look at. Take a walk to the Olympic Park, you see most of the city from the olympic park and it is far enough away from all of the main attractions to get a bit of quiet while you enjoy the view. You can also imagine how busy it would have been during the Olympic Games! Just walk! Everywhere you walk and look it’s is beautiful, but be sure to keep your eyes open as you walk around. The architecture of the buildings you pass and the little side streets that draw you in taking you to a hidden gem. You’ll also see beautiful parakeet type birds flying around, living in the palm trees. It is beautiful to see!